Muslim Problem, What Muslim Problem? It’s Islamic Jihad’s 23rd anniversary today and they held a little celebration, lots of Islamic fun was had by all! 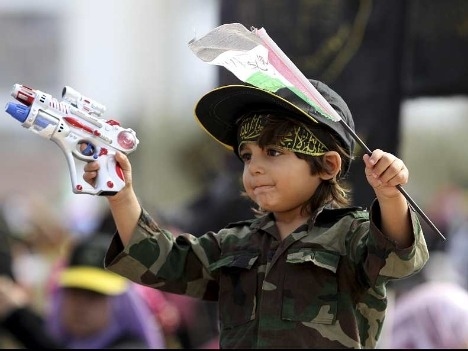 Young men and boys wearing white T-shirts with a slogan in the shape of a rifle carried portraits of militants killed in combat, under the black flags of Islamic Jihad. Ramadan Shallah, the group’s exiled chief, currently residing in Damascus, sent a recorded message marking the anniversary of the assassination of the group’s leader Fathi Shiqaqi in Malta in 1995, by presumed Israeli secret agents. 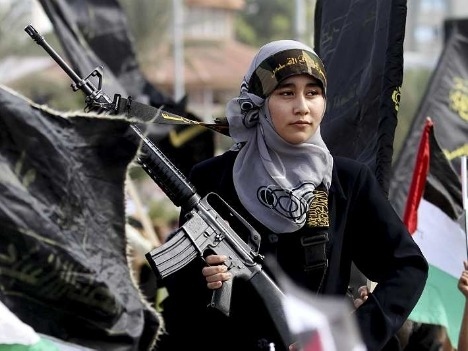 Senior leaders of the ruling Islamist group, Hamas, joined the open-air gathering, the largest for years in honor of Islamic Jihad with up to 100,000 attending according to its organizers. Now seriously, ask yourself, do these people strike you as being members of a Religion of Peace, content to harmoniously coexist alongside Israel (or the United States for that matter), abiding by a rationally negotiated, equitable two state solution? Do these people seem even remotely interested in Obama’s “outreach to Muslims”? Of course, the answer to both questions is hell no! These Muslims are brainwashed from birth to annihilate Israel, kill every Jew, convert or kill every infidel, including you and your entire family, and destroy your civilization and way of life. The only reason they haven’t accomplished all these goals is that they’re not strong enough, yet. But don’t worry, Western appeasement only gives them much contemptuously appreciated strength and encouragement. It’s an undisputed fact that Islam has declared war on the West multiple times in recent history. Whether you want to fight them or even take the threat seriously, it doesn’t matter. They’re deadly serious and they will take the fight to you. The evidence is so overwhelmingly pervasive to the point where you can’t rationally ignore it. Turkish news channel CNN Turk reported on Friday that a deal to secure the release of abducted Israel Defense Forces soldier Gilad Shalit may be reached by Tuesday. The TV channel said that Turkish officials were currently holding talks on the issue with Hamas officials in Damascus, the base of the Islamist militant group’s political leadership. Reuters Friday quoted a Palestinian official as saying that Turkey and Qatar have taken a lead role in the negotiations over Shalit in recent months. The CNN Turk report came after Defense Minister Ehud Barak on Friday said that Israel’s leadership was making “supreme” efforts to bring Shalit back home. If true, this would obviously be extremely good news!